You have a special event coming up, and you want to serve a hearty meal that everyone loves. How about a BBQ buffet in Spokane, WA, from Charley's Catering Company? Let us provide you and your guests with delicious barbeque and all the sides at affordable prices. Our company is so successful because we believe in catering to you with fantastic food, themed table decorations, and outstanding customer service. For our barbeque buffet catering, we outfit the tables with a traditional Western motif and include disposable plates, plastic ware, and napkins. These, plus staffing, are included in the price you pay. Over the years, we have built our reputation on making sure our customers and their guests are delighted by our food and pleased with our service. This is why we can confidently offer food catering services --both full and self-service with a satisfaction guarantee. We want you to know that our caterer is more than capable of handling buffets from small to large. Just let us know how many people you’re inviting to the festivities. Our skilled and experienced team has the know-how and organization to make sure everything goes right for we well know that such essentials contribute greatly to the enjoyment of all at the event -- especially you. What a fabulous job you did with catering our Barn Dance!! Everything was first rate, from the food and its presentation to your staff and how friendly they were while providing great service. A barbecue of this size is quite a job, all 600 guests had a great time. We have received a lot of positive comments from those who attended. In fact, they want to know when we are doing the next party! You had so many great ideas, and our building was certainly DRESSED UP and ready for the party. Shirley, you are always a pleasure to work with. Thank you for all your efforts in making our party such a huge success. - Lori Houk - Vice President, Wilbert Precast, Inc. Contact us today to arrange a meeting with our caterer about your BBQ buffet. 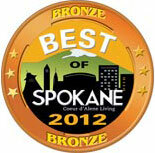 We proudly serve customers in Spokane, Washington, and the surrounding areas.